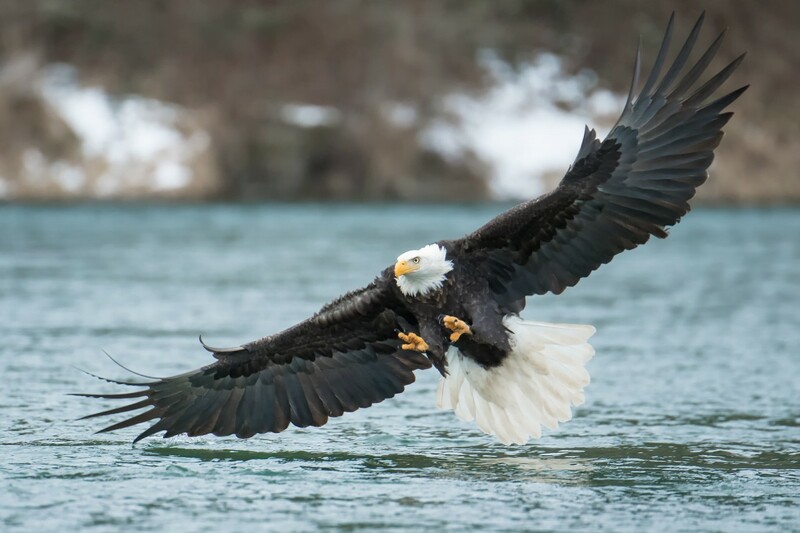 Bald eagle is a predatory bird species found in North America. They are large in appearance and have brown color on their wings and body, with bright white head and tail. They are called bald eagle not because they are bald, but because of the contrast in color of their head and body. Due to the laws that were implemented to protect them, the conservation status of these species is least concern, that is, these birds are not threatened or endangered. Their diet mainly consists fish. 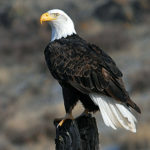 The bald eagle has been the national emblem of the United States since 1782. Also, it is a spiritual symbol for many people. These birds are not really bald, but got this name because of their gleaming white head in contrast to their dark brown body. Bald eagles are a member of Accipitridae family, i.e., they are birds of prey. The two species of bald eagle include the northern bald eagle and the southern bald eagle. The female bald eagle is larger in size than the male bald eagle. The size of female bald eagle varies from 35 to 37 inches with a wingspan of 79 to 90 inches. The size of male bald eagle varies from 30 to 34 inches and a wingspan of 72 to 85 inches. Bald eagles are diurnal, which means they are active during the day. 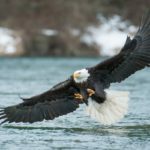 The primary diet of the bald eagle is fish, although they eat a variety of other animals and birds that are available easily. 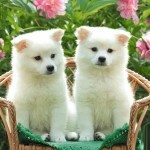 They also prey on ducks, waterfowl, and small mammals, like rabbits, raccoons and squirrels. Bald eagles are said to be opportunists when it comes to diet, as these birds also steal food from other birds or animals. 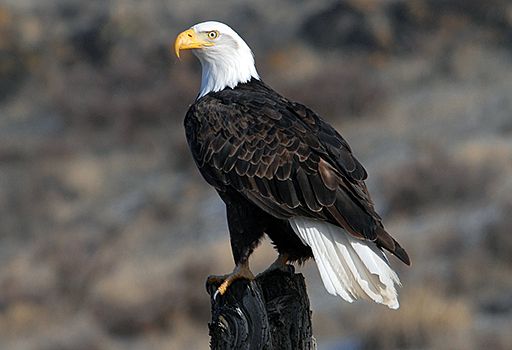 Bald eagles are also scavengers and may prey on sick and dying fish, birds and animals. 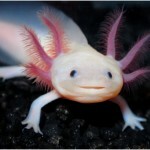 They prefer to live near big lakes or other large water bodies where fish can be found. 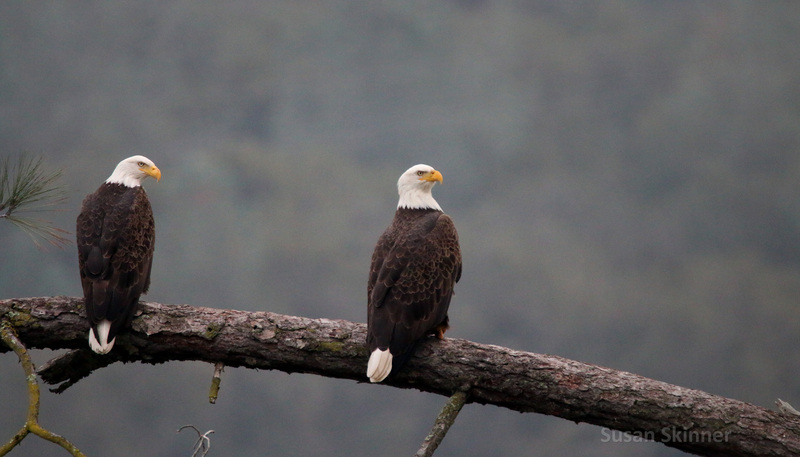 Also, for nesting and roosting purpose, bald eagles prefer dense forests near the lakes. It prefers tall trees with good location. This is because, tall trees will provide excellent visibility to find any prey. Their habitat is also dependent on the location. For example, in Florida, their nesting habit is generally mangrove swamps, seasonal flooded woods, pinelands and pasturelands. Bald eagles usually prefer minimum human disturbance and secluded areas for nesting. 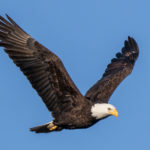 Bald eagle is a very powerful and efficient flier and soars on the thermal air column of air rising in the lower altitudes of the earth’s atmosphere. 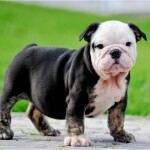 They can reach the flying speed of 56-70 km/ph. These birds migrate according to the weather conditions and take the help of thermals during migration. They usually migrate during the daytime. Bald eagles make high pitch squeaking sound. Their another common behavior is cartwheel display in which two eagles clasp each other’s talons while flying and let go and spin down together. They let go and start flying again almost after reaching the ground. The bald eagles build their nest during the breeding season, and both the male and female contribute in building the nest. The size of the nest complements the size of the bald eagle. Once they find their mate, they remain together until one mate dies. Then the surviving mate searches for another mate. 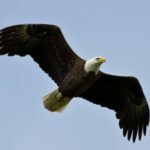 Bald eagles enjoy safety from other predators, as it is on the top of the food chain and there are not really any predators that threaten the young ones or the eggs of the bald eagles, as they are very protective about their young ones. Parents take care of their young and provide them with food until the young ones are independent. Also, bald eagles like to groom their feathers. Sometimes, even mates groom each other’s feathers. The bald eagles usually have only one mate and they use the same nest year after year. The female lays about 2 to 3 eggs in an enormous nest. These eggs hatch in about 5- 6 weeks, and the chicks are ready to fly when they are 12 weeks old. The chicks usually stay with their parents until they are 20 weeks old. During the breeding season, the male and the female eagle build nests together. Bald eagles become highly territorial during the nesting season. 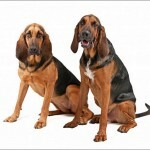 They usually are ready to mate when they are 6 years old or older. During the breeding season, the eagles perform aerial display also known as cartwheel in which two eagles clasp each other’s talons while flying and let go and spin down together. They let go and start flying again almost after reaching the ground. Usually the female eagle initiates the copulation process and emits a single note call. But sometimes, a male eagle may also initiate the process. 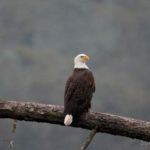 Both the male and female bald eagles have dark brown body; white neck, head and tail; and yellow legs and beak. They even have pale yellow eyes. Young eagles usually change their color before reaching adulthood. Their beak has hook at the tip that is used for tearing the food. The strong and sharp talons are used to catch the prey by piercing into their flesh and also for holding the prey. 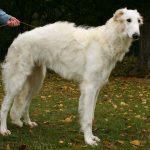 Their strong tail is used for flight and maneuvering. Their tails provide them better balance and help them increase the effect of thermals. The feathers play an important role in the process of pliability. Also, the feathers protect them from extreme cold conditions. The average lifespan of bald eagle is about 28 years but they may also live longer. 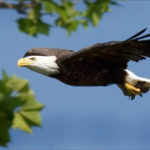 It also depends upon the location and the eagle’s access to prey. 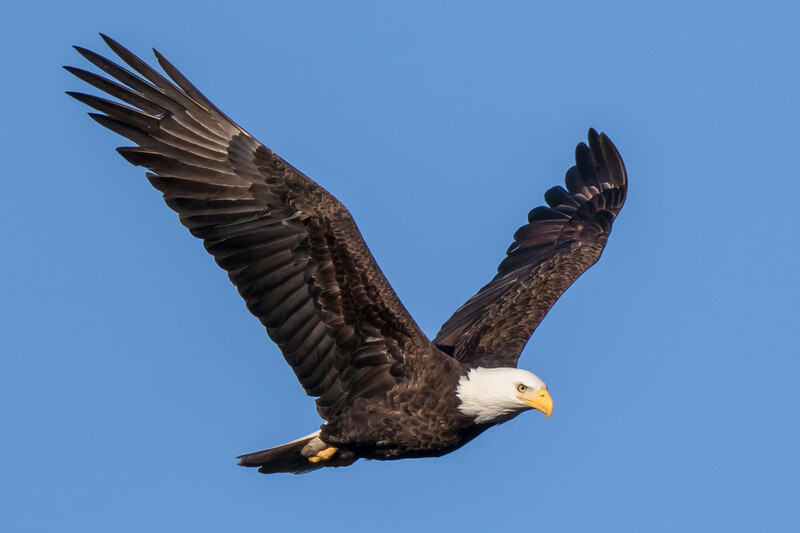 As bald eagles are at the top of the food chain, the get affected by all the chemicals consumed by the birds and animals of lower food chain. 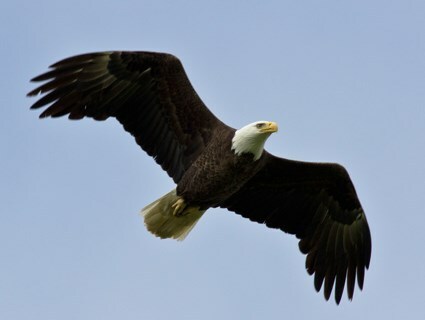 The most dangerous chemical that had affected the bald eagle was DDT, a pesticide that is now banned. Another concerned for bald eagles is lead poising. This happens when the eagle consumes a dead animal or bird that has been shot by lead bullet. 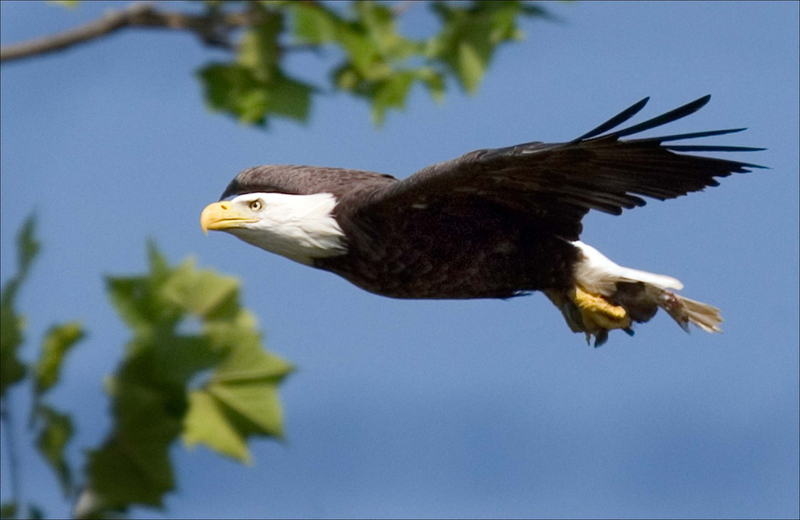 The bald eagle’s eyesight is four times sharper than that of a person with perfect vision. Their feathers protect them from extreme cold weathers.